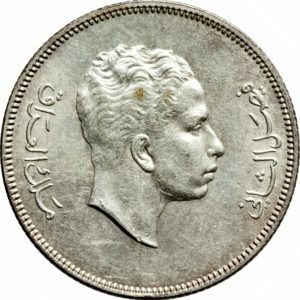 A 50 Fils coin of King Faisal II of Iraq, who was assasinated 6 years after Paget designed a set of coins bearing the King’s portrait for the nation of Iraq. Little did Thomas H. Paget, Burwash Common, Sussex, England, realize that six years after he sketched King Faisal II of Iraq in the lad’s tiny school bedroom at Harrow, the King would be the victim of an assasin’s gun. Paget, designer of coins and medals of kings and commoners, designed the portrait of Faisal that was used on coins of Iraq between 1953 and 1955 in denominations of one, two, four, 10, 20, and 100 fils. Faisal had been king since the age of three when his father, Ghazi, was in killed in 1939. On July 14, 1958, the royal family fell victim to the military coup led by by General Abd al-Karim Qasim. Quasim, who was later portrayed on a 100 fils copper-nickel piece, was shot by a firing squad on February 9, 1963. 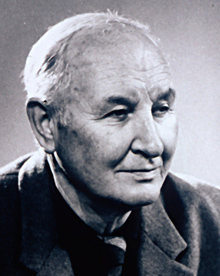 My father was Walter Paget, the well-known painter and illustrator. Two of my uncles also were artist, one of whom, Sidney Paget, created the Sherlock Holmes drawings in the Strand Magazine. I was born in 1893 at Croxley Green, not far from London and christened Thomas Humphrey but I use only the initials H.P. as a signature on coins and medals. I received my art education at the Central School of Arts and Crafts and at the Royal Academy Schools, London, where I won a Landseer scholarship, but this course was interrupted by the first world war in which served as a lieutenant Royal Navy Volunteer Reserve in anti-submarine patrol. After demobilization, I worked as a sculptor and later returned to the Central School as a visiting teacher, giving four lectures a week. During that time, among other work, a portrait bust of Sir John Cargill of the Burma Oil Co., and a relief of Andrew Bonar Law, the then late Prime Minister, were exhibited at the Royal Academy. In 1925, after receiving my first commission from the Royal Mint, The British Royal Infirmary Medal, I concentrated almost entirely on coins, seals and medal work. The Master Mariners medal was designed in 1935 to mark the occasion of the Prince of Wales becoming president of the Society. This medal was well received, and in a letter to me from the deputy master, Sir Barton Chadwick, he said that the Prince was charmed with it. This led, a year later, to an invitation to be one of three artists to compete for coinage design for the new reign. The other two were a royal academician and the chief artist then employed by the Mint. It was, with an understandable thrill that I received this telegaram “Buckingham Palace, ‘Thursday afternoon 3:30,'” for the first sitting from King Edward VIII. My portrait effigy of the King was chosen by him for the imperial coinage and the one by Percy Metcalfe for the crowned colonial head. The ship used for the halfpenny was based on the “Golden Hind,” Sir Francis Drake’s ship, and was selected from a set I had submitted for the reverse designs. Although this coinage was never issued, a set was minted and I have in my possession a trial two-shilling piece with a plain reverse. Some medals were also struck and I have two of these, which, of course, are quite scarce. The King asked that no one should lose by his abdication and for that reason both Metcalfe and I made the models for the coinage fo King George VI. These were completed and approved at Sandringham, where members of the Royal Family were in residence, under the critical eye of Queen Mary, whose interest in art matters was well known. We spent a delightful and very memorable day there. This coinage was not altered until 1947, when India became a Dominion. I was asked to change to change the inscriptions and in 1949, to redesign the Royal Cypher on the sixpence. Among many other designs for a coin or for the complete coinage which I have made for 19 different countries, are the ones for the Domincian Republic, Bolivia, Canada, Uruguay and the Carribean Territories in the Western hemisphere. In 1952, came the commission for the portrait of King Faisal II of Iraq at Harrow. I had two sittings from him, one in his tiny school bedroom. It would have been hard to imagine then that this very pleasant and likable young man would be the victim of an assasin so soon afterwards. The Royal visits to Southern Rhodesia, when Cecil Rhodes , the “Empire Builder,” was honored by Queen Elizabeth II, was the occasion of a Paget-designed crown for that nation. 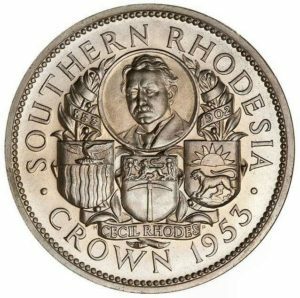 In the same year, the Rhodes commemorative crown piece was made for Southern Rhodesia. In 1943 I married Winifred Turner, a very well-known sculptress. She also had an artist father, teh sculptur Alfred Turner, a prominent member of the Royal Academy. Winifred’s help and criticism has been most useful to me in my work. My most recent designs include the South Arabian coinage, the portrait of Queen Elizabeth II on the Isle of Man gold coinage and the new Irish 10 shilling commemorative piece, with the portrait of Padraigh Pearse on the obverse. Many seals and medals, too numerous to list here, have been commissioned, but I should like to mention the Bank of England seal and the Ministry of Housing and the Lord Nuffield medals. My work has been exhibited at the International Exhibitions of Paris, Madrid (where the case from the Royal Mint received the gold medal award), Copenhagen, Antwerp and frequently in the Royal Academy, London. 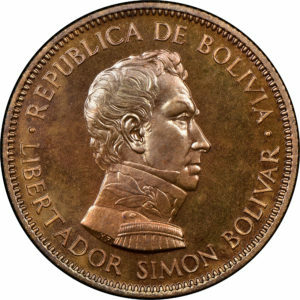 The initials “HP” of Thomas Humphrey Paget appear just behind the epalets of Simon Bolivar on 10 Bolivanos coin used in Bolivia in 1951. 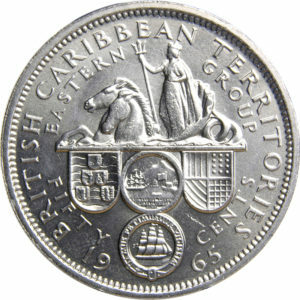 The reverse of the British Carribean Territories 50-cent coin of 1965 was the work of Paget. I have often been asked which I consider to be my best coin. I think the George VI has proved to be technically good because it has worn so well in circulation and has justified the type of relief used in the first model. Simon Bolivar, the Rhodesian Crown and Carribean 50-cents are others I like. As all these coins are either Proof of trial pieces, they make quite a good smai\ll collection. Originally published in the September 28, 1966 edition of Coin World and reprinted here with permission of the publication. 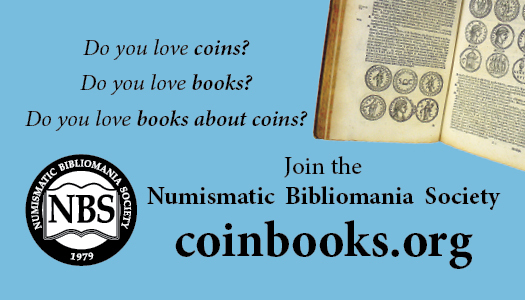 Thanks to David L. Hill, the Francis D. Campbell Librarian of the American Numismatic Society, for his assistance in locating this article.